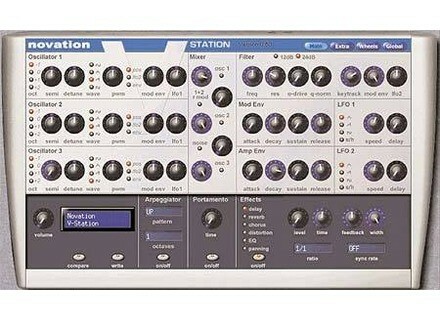 V-Station, Virtual subtractive synth from Novation. 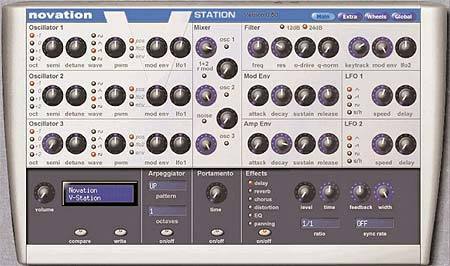 Novation has updated V-Station to v1.5.1 for both Windows and Mac OS X.
VST parameters with 0 centred range now normalised. NOTE: this fix causes patches made on older versions of V-Station VST to load incorrectly, consequently a new 'legacy mode' option has been added to the global options page. If you are loading a patch created on an older version of V-Station then set 'legacy mode' to 'on'. AU presets saved with patch number 356 or above now recalled correctly (settings and sessions saved by the new version, with a current preset number of 356 or above will not be loadable with older versions of v-station). Improved rotary pot control behaviour. Fixed bug in saving of env trigger states. Knobs can now be reset by ctrl-clicking (so can be reset when pot ctrl set to rotary) as well as double-clicking. V-Station now authorizes correctly in Digital Performer on Intel Macs. Fixed crash caused by frozen V-Station tracks in Logic. V-Station GUI now appears correctly when Automap-wrapped version is loaded in Logic. Fixed crash caused by holding note past loopback point with an arpeggiated patch in Logic. Arpeggiator now triggers correctly at start of playback. Patch rename window no longer appears behind plug-in window in Live (Mac VST version only). Fixed crash when using V-Station in Windows on a computer with a hyperthreading processor. OWC Mercury On-The-Go 500GB Other World Computing (OWC) has announced their highest capacity portable, bus-powered storage drive to date – the OWC Mercury On-The-Go 500GB, 5400RPM portable storage drive. Peavey ReValver MK III Peavey announces ReValver MK III: amplifier modelling software in stand-alone or plug-in formats, compatible with all VST/AU based systems. Tanager Audioworks Chorducopia Tanager AudioWorks, Inc. announces the availability of Chorducopia™ — containing a searchable database with over 50 chords for every key, and runs on both Windows and Mac computers.